The Wii U's boost from Mario Kart 8 wasn't just some shot-in-the-dark that gave the Wii U a small taste of momentum, the game was a lead-in to a very energetic and hype-filled E3 direct that Nintendo unleashed to a startling effect. The gaming community has slowly turned around their perception of Nintendo and this has greatly affected their sales both in the U.S., and in Japan. According to Nintendo Everything, Media Create released their latest software and hardware charts for the week ending on June 22nd, which was last week. As per the usual trend, Nintendo has found a way to keep their lead on Sony over in Japan. The charts show that the Wii U was third-place on the chart behind the 3DS and PS Vita, managing to move 10,715 SKUs in Japan in the previous week. 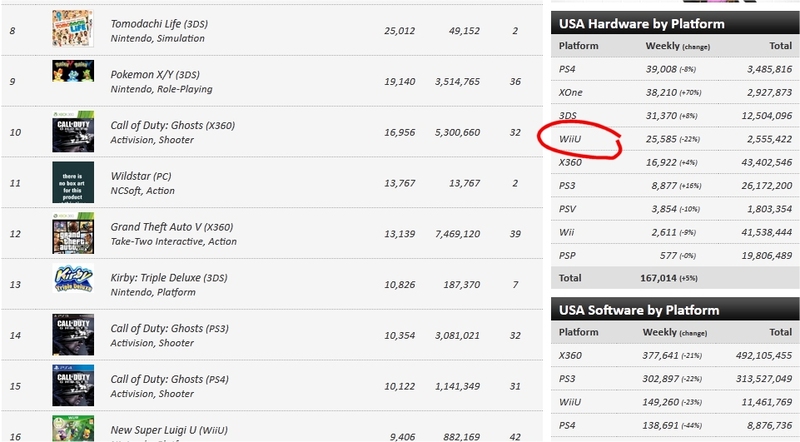 The PlayStation 4 was fourth, just behind the Wii U, only managing to move 7,009 units. The week before that the Wii U still managed third-place, moving 12,249 units, where-as the PS4 was only at 8,395 units moved. It's expected for the consoles to slow down in sales during the summer months before they get a huge push leading up to the fall, holiday season. Consistently, however, the Wii U has shown that it's pushing a sizable lead on the PS4 in Japan on a week-to-week basis. But what about the performance in America? Well, we won't have any stats on the sales in America until the NPD report is released in the middle of July, next month. For now, we only have to go by the weekly charts provided by VGChartz, which sort of gives us a window into the soul of the sales trends happening in the United States. For the week ending on June 14th, VGChartz shows that the PS4 continues to lead the pack at 39,008 SKUs, followed closely by the Xbox One – and presumably, this is due to the Kinect-less, $399 unit – at 38,210, with the 3DS in third and the Wii U in fourth, moving 25,585 SKUs. Now, according to VGChartz the Xbox One's sales ending on June 14th saw an increase over the previous week of 70%. This could mean that the $399 bundle really is taking off and gaining ground exactly where it needs to. How long the sales will stay up for the Xbox One at the $399 price-point remains to be seen, but it's definitely the shot in the arm that the company needed in order to bolster sales and keep the console relevant against the PS4. However, we still can't discount the Wii U in all of this. Mario Kart 8 moved some big numbers coming out of May, and that's bound to play a pretty big part in the sales numbers for June, once the data becomes available. For now, Nintendo can rest slightly easier knowing that they still have Japan in their pocket and Sony doesn't appear to be gaining ground any time soon.